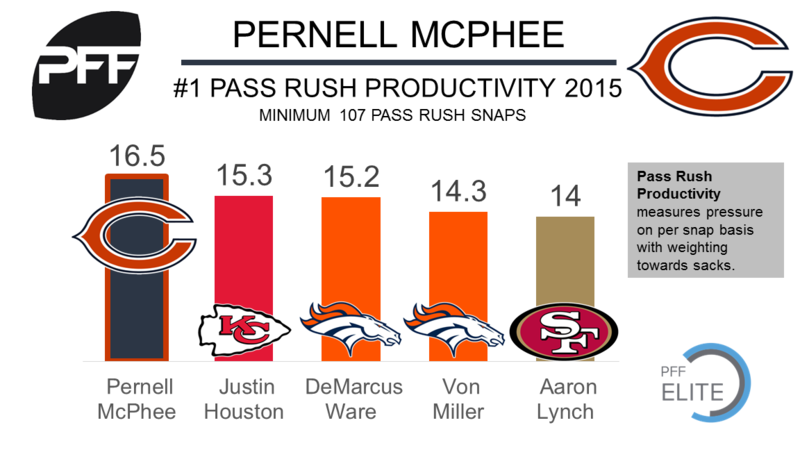 Chicago Bears edge defender Parnell McPhee is dealing with a right knee issue according to Jeff Dickerson. McPhee was placed on the PUP list early Thursday as Bears head coach John Fox revealed an “irregularity” was discovered during McPhee’s camp physical. McPhee missed the majority of the 2016 season with knee issues as he was limited to just 273 snaps, which was a career low. His injuries restricted his production in 2016, he earned an overall PFF grade of 74.3 last season, the worst of his six-year career. In 2015 McPhee was one of the best edge defenders in the league, he ranked as the seventh best edge defender with an overall PFF grade of 87.7, the best grade of his career. McPhee led the league in 2015 with a pass rush productivity (PRP) of 16.5, he created 63 total pressures on just 296 pass rush snaps (PRP measures pressure created on a per snap basis with weighting towards sacks).